3 Bdrm Top flr Flat. Hall. Lounge/Dining rm. Kitch. 3 Bdrms, 1 with ensuite shower rm. Bathrm (CT band - TBC). Parking. 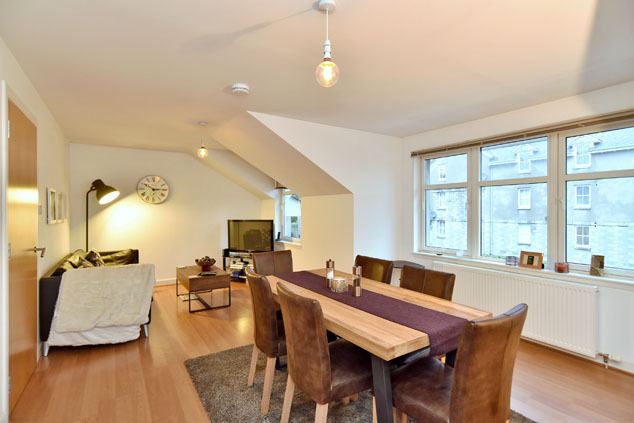 Price over £225,000 Entry by arr. Viewing contact solicitors. Below Home Report Valuation (EPC band - C). 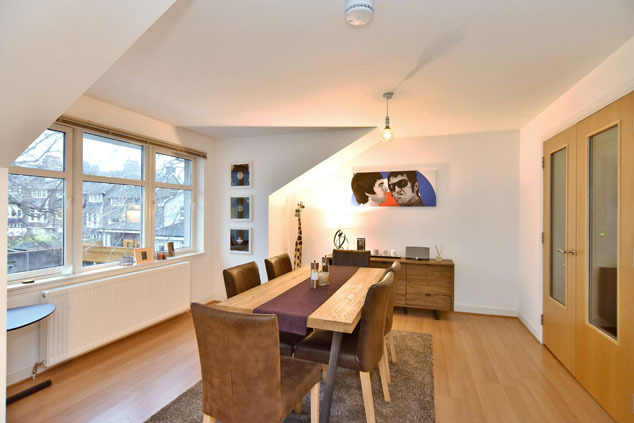 Forming part of a modern purpose built development in a popular area close to the city centre, this THREE BEDROOM TOP FLOOR FLAT has been finished to a high standard throughout and offers generous accommodation, which is ready to move into. Enjoying a peaceful setting set away from the road, the property boasts many attractive qualities including a spacious Lounge with dining area, modern Kitchen with various built-in appliances, Master Bedroom with En-Suite facility, two further Bedrooms and Bathroom fitted with a white three-piece suite. Worthy of mention there is a security entrance system and allocated parking space in the residents car park. All carpets and other floor finishes, curtains, blinds and light fitments will be included in the sale. 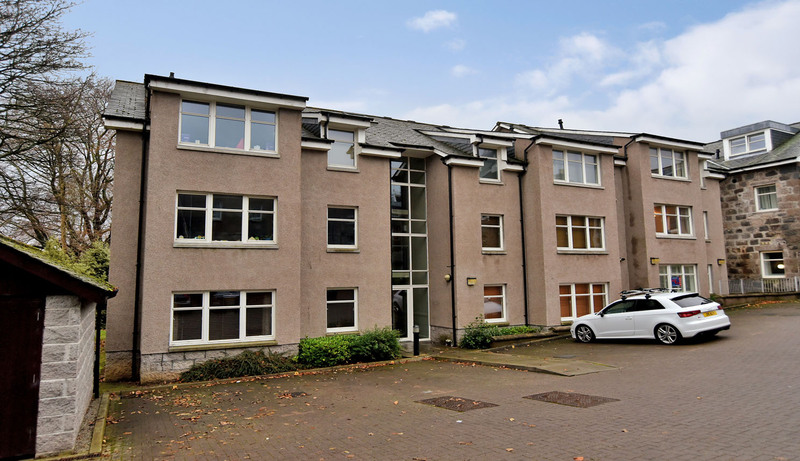 Polmuir Road is situated in the popular Ferryhill area in a location which offers easy access to some of the main arterial routes throughout the City and is extremely convenient for the City Centre and for the oil related offices on the South side of Aberdeen. 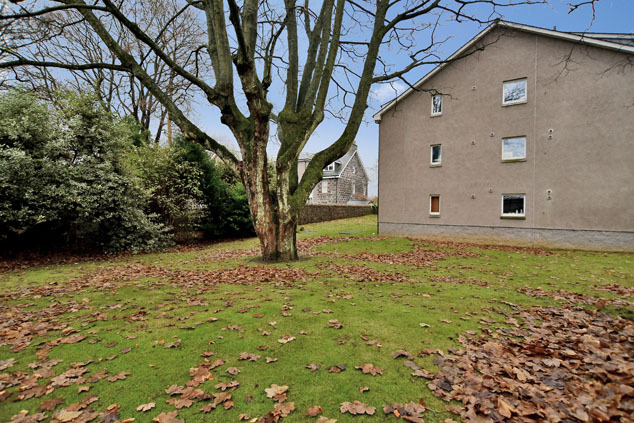 The area is also well served by public transport facilities and offers the opportunity to enjoy the many attractions of the DuthiePark, including the Winter Gardens and to enjoy lovely walks along the banks of the River Dee and the old Deeside Railway line. From the West End of Union Street, turn into Holburn Street and at the roundabout take the first exit into Fonthill Road and continue through the traffic lights and take the first right onto Polmuir Road. Continue ahead and Number 19 is located on the left hand side. 19T is located straight ahead in the last block on the right. ENTRANCE HALLWAY: A hardwood door opens to the Central Hallway, which offers access to the lounge, kitchen, all three bedrooms and bathroom. 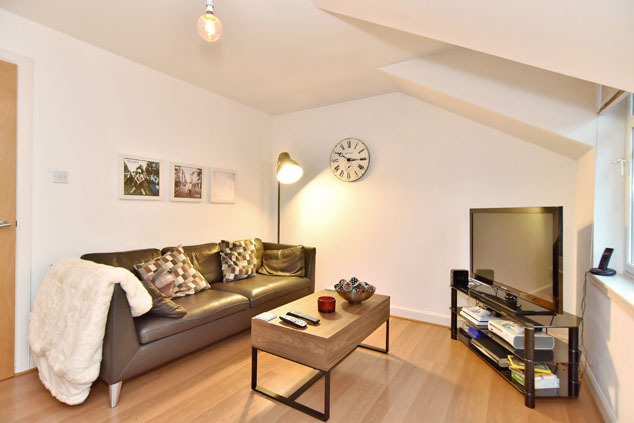 Hatch to loft space, security entry handset, 3x light fitment, radiator, laminate wood flooring, and double built-in cupboard housing electricity meter and fuse box. LOUNGE: 21’8” x 13’7” approx. The spacious Lounge provides space for both living and dining furniture and boasts two front facing windows drawing in ample natural light. French doors open to the kitchen. TV point, 2 x light fitment, radiator, laminate wood flooring, fitted blinds to both windows. KITCHEN: 9’9” x 9’5” approx. 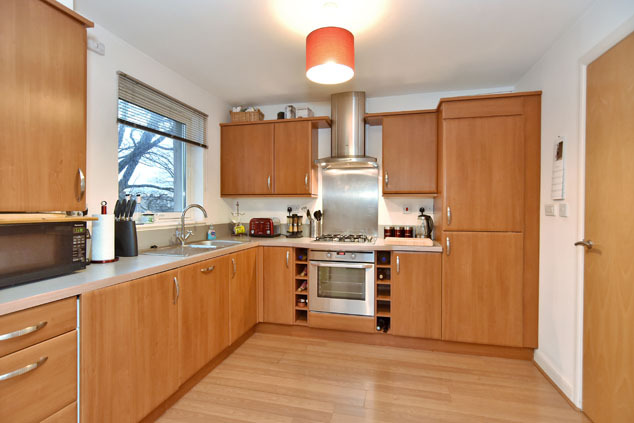 The Kitchen is fitted with a range of modern quality base and wall mounted units with contrasting work surfaces, splashback panel, and stainless steel sink unit, built-in Oven, Gas Hob with Chimney Extractor Hood above, integrated Fridge/Freezer, Dishwasher and Washing Machine. Light fitment, radiator, boiler concealed within units, fitted blinds. MASTER BEDROOM: 12’ x 9’5” approx. 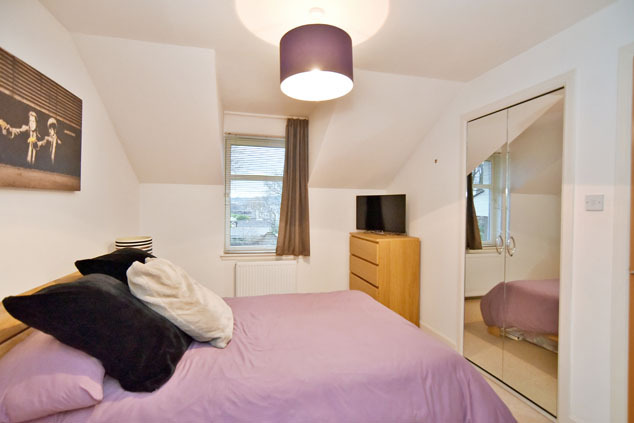 Well proportioned Double Bedroom with dual aspect to the side and rear. Double built-in wardrobe with mirrored doors. Light fitment, fitted blinds and curtains, fitted carpet, radiator. 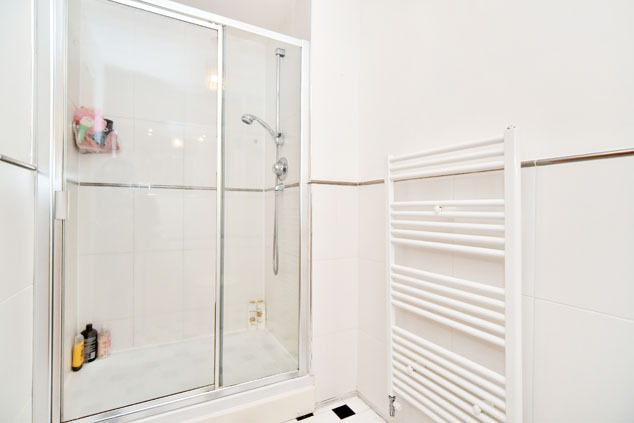 EN-SUITE SHOWER ROOM: Fitted with a double shower enclosure, w.c. and wash hand basin set into vanity unit with storage cupboards below and over pelmet with downlighter. Splashback tiling, light fitment, heated towel rail, shaver point, ceramic floor tiles. BEDROOM 2: 15’6” at longest x 12’7” at widest approx. 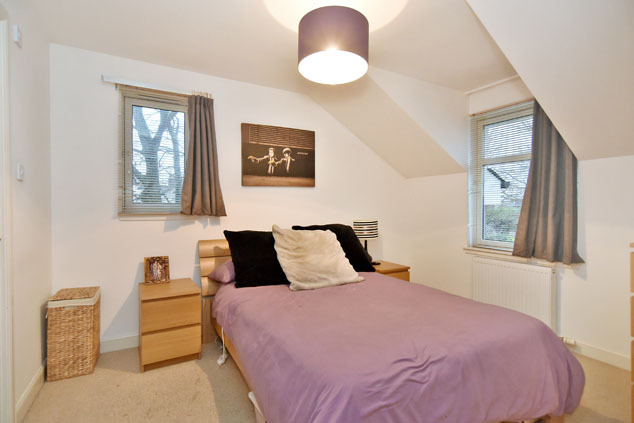 Second Double Bedroom to the rear with two windows allowing ample natural light. Double built-in wardrobe with mirrored doors. Light fitment, fitted blinds and curtains, radiator, fitted carpet. BEDROOM 3: 8’5” x 8’4” approx. 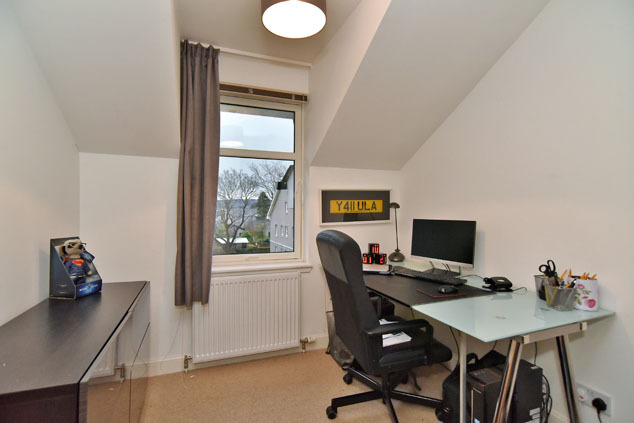 Third Bedroom to the rear, which would make an ideal home office. 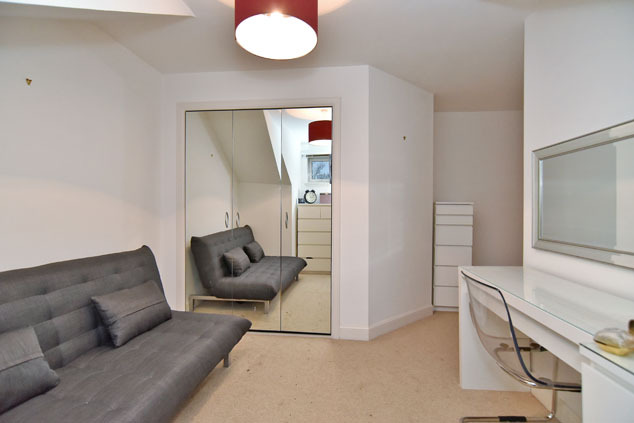 Light fitment, fitted blinds and curtains, fitted carpet, radiator, and telephone point. 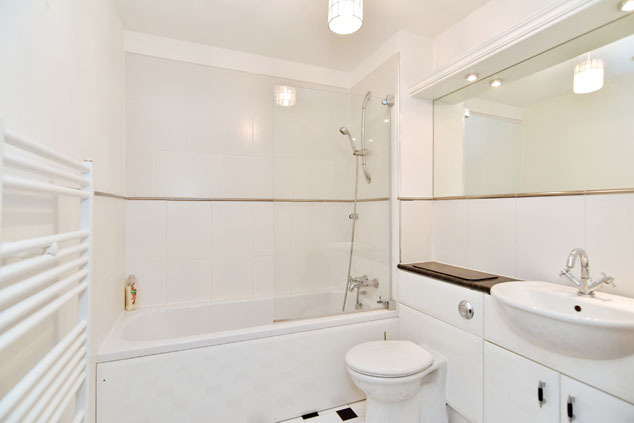 BATHROOM: Centrally located, the Bathroom is fitted with a white three-piece suite comprising bath with shower over, w.c. and wash hand basin set into vanity unit with storage below and over pelmet with down lighter. Light fitment, splashback tiling, ceramic floor tiling, wall mirror, shaver point, heated towel rail, extractor fan. OUTSIDE: There is a communal Bin Store and Bike Shed. 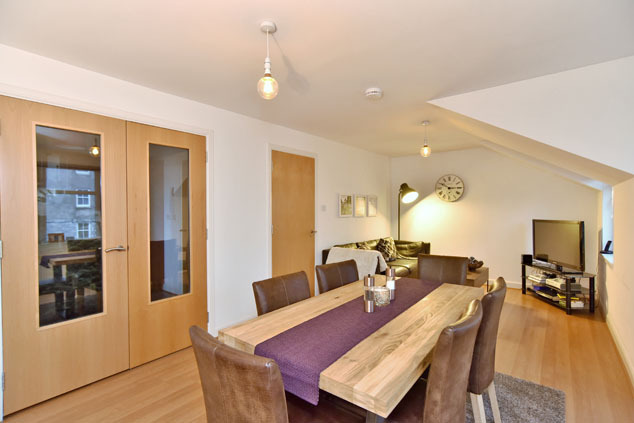 PARKING: The property has ample parking facilities in the Residents Car Park with a space being allocated to the property.onthly fee is payable for the upkeep of the building and surrounding area of which this property forms part.